At his office Christmas party last year, Son No 1 won a $10,000 travel voucher in the office raffle. A few days ago, he and his family took advantage of this good fortune and left for Hong Kong Disneyland and also to celebrate his 40th birthday there before going to Singapore to visit relatives. Son No 2 and wife also went along to join them and Grandma C and myself were left behind looking after their two dogs. 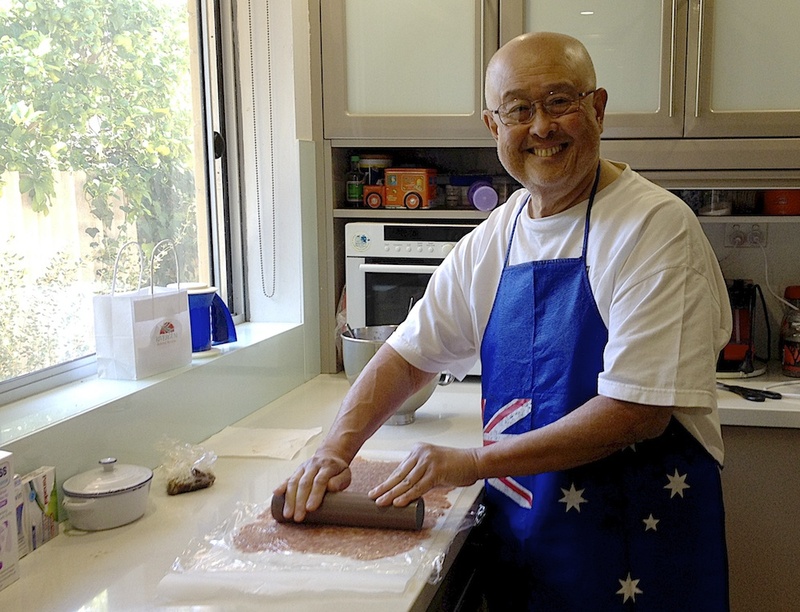 So Grandma C decided to have a bon voyage dinner before they all left, and I decided to make my bak kwa for the grand children, something they love. 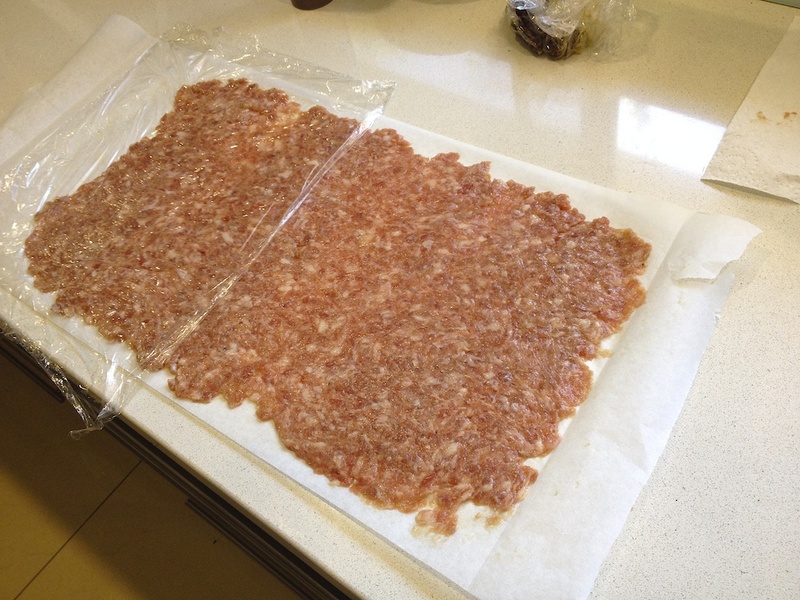 I made a special trip to the Asian butcher, who is rather far away, to get the fatty minced pork (1.6 kg @ $8.50/kg), and, once home, mixed it up with the marinating ingredients using Grandma's cake mixer. 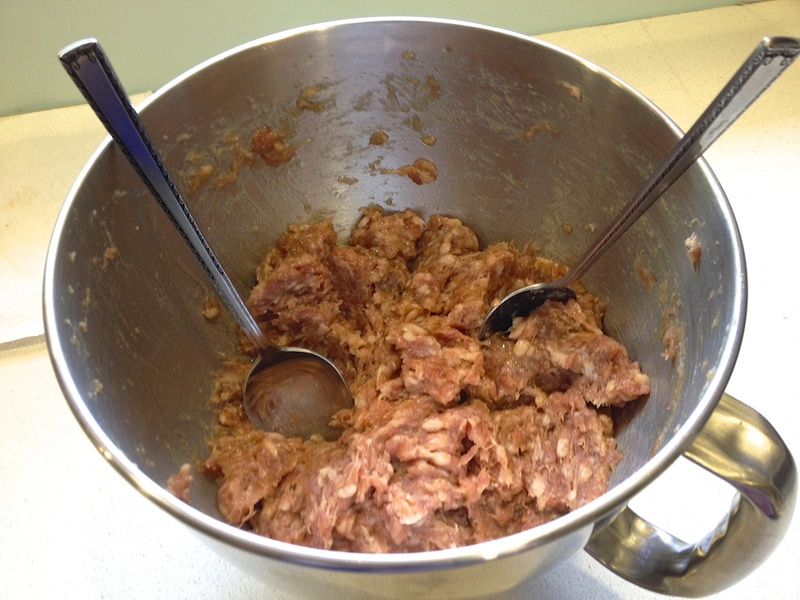 Then it is left overnight in the fridge and, after that, the rolling out process begins. 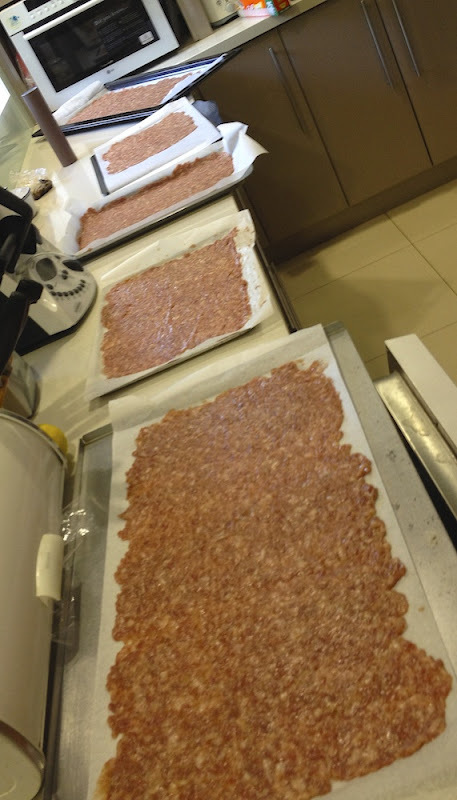 The next stage is to get them all on trays and into the oven at minimum heat to dry up. 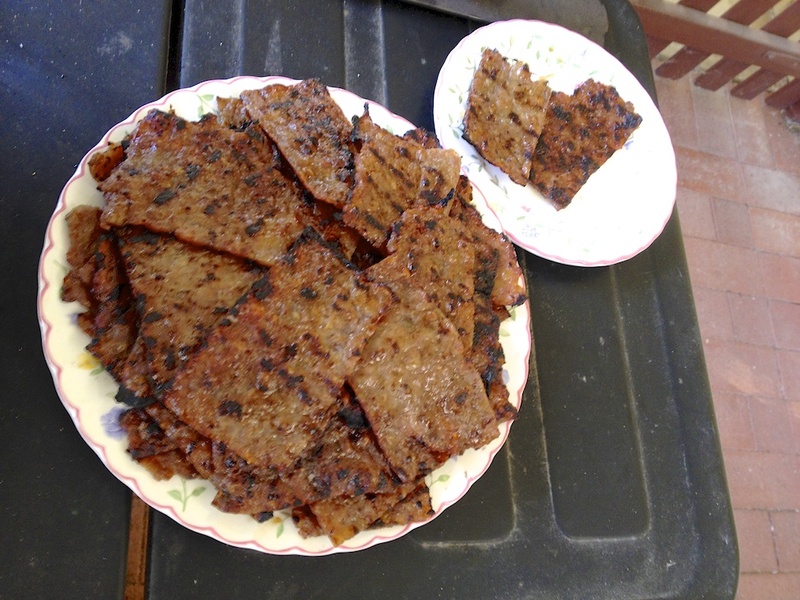 There are some variations in methods here: some internet recipes suggest baking them to completion in the oven, while others suggest merely drying them and then barbecuing them. I favour the second method, though one day I'll try omitting the drying stage and just barbecue them. Above, dried and out of the oven, and cut up with a pizza cutter. 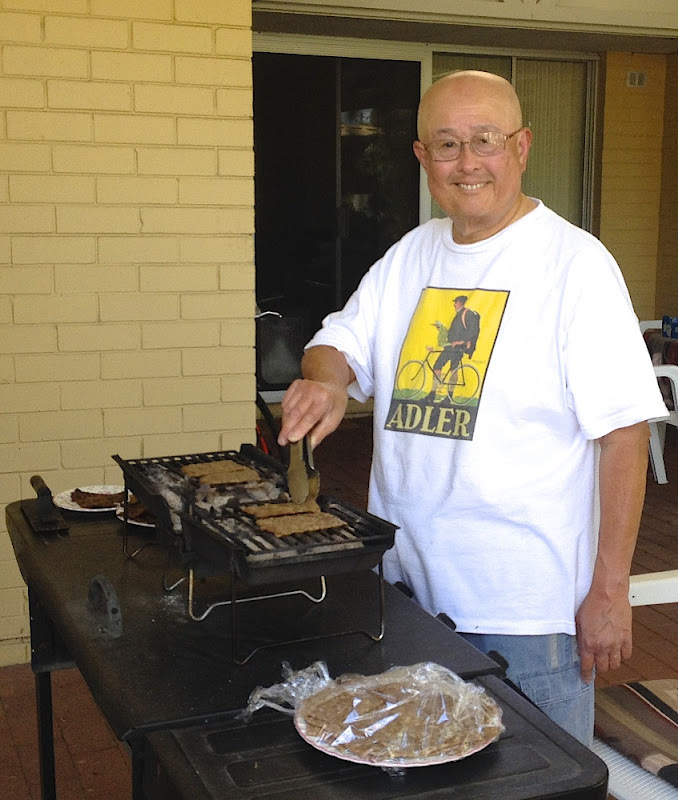 Barbecuing them just before the grand children arrive. The small plate holds the qc rejects: one was burnt and the other I dropped on the floor. They will be for the dogs. If you're interested, the recipe I eventually used after looking at a few on the internet is here. I did make a few variations which some other recipes use, eg, adding 5 spice powder and substituting the wine with Chinese rose wine. 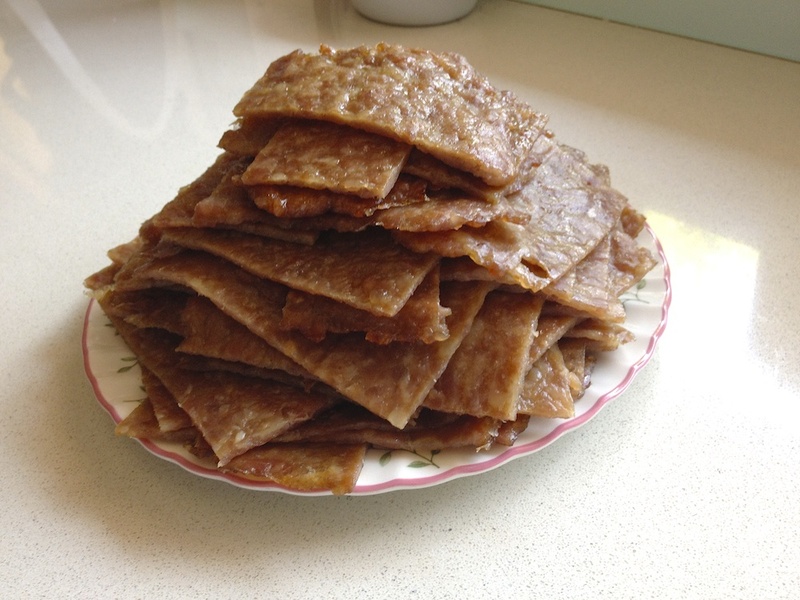 I used to make my own bakkwa in Sg because I felt $50 a kg is atrocious. 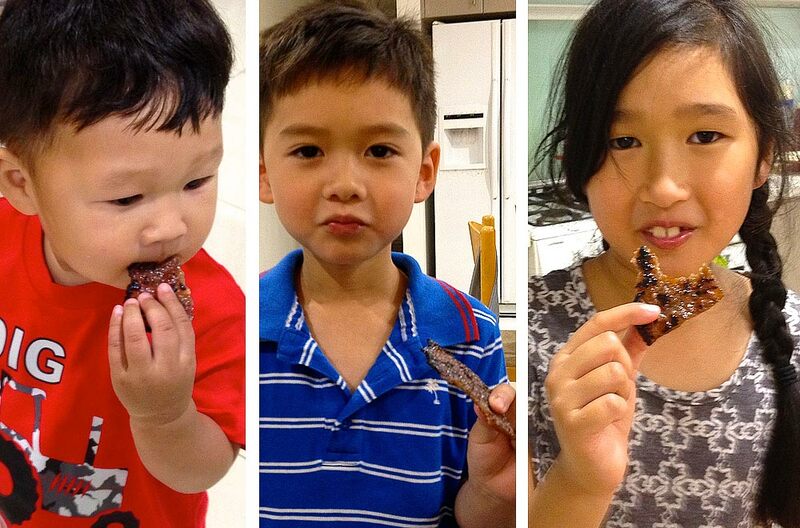 I did bake them to completion as it is hard to barbecue in Sg. But my barbie here runs on gas so it'll never have the same flavour as the charcoal barbie you're using. Yes it is very expensive. There is a lady here in Langford who makes them for sale in Asian grocery shops. Her shop is called "Goodies Galore" but you have to pre-order before she can supply you. A few years ago they were about $38 a kg. I don't know what it is now. Ooooo...they look really good! You will have to make me some should I ever get the chance to hop over to Perth. $10,000!!! Wowwwww!!!!! Wish I had your son's kind of luck. I would be on the next plane over to see you there! Hehehehehehe!!!!!! You'd be very welcome. Yes, he was indeed very lucky, and it is good that he chose to spend it with his family. This was the biggest win in at least 3 generations, to my knowledge!! How about making some vegetarian bakwa? It should earn you plenty of merits, heh heh. I've heard of mushroom bak kwa mentioned. Haven't tried it myself. Have you? The Chinese are able to cook up a vegetarian equivalent to almost any meat item - vegetarian goose, chicken, duck, beef, abalone, fish, etc - in any form, steamed, roasted, cutlet, whatever. Western visitors often marvel at Chinese creativity and ingenuity in vegetarian cuisine. Try them in your next visit to SG. I have eaten mock meat items at a vegetarian restaurant here in Perth (called Happy Buddha, incidentally). They are indeed very good. Will look out for vegetarian bak kwa next time I go to Singapore.